Posted on Dec 20, 2018. The Leadership Louisville Center’s Focus Louisville program has served as the gateway for business and community leaders to explore Louisville from the inside out, leaving participants with new knowledge and connections and ready to lead as engaged citizens. Focus Louisville is offered four times annually and registration is now open for the February 21-23 and May 16-18, 2019 sessions. DMLO CPAs, is a supporting sponsor of the program. With over 5,000 graduates (see list of Focus Louisville graduates) and over 100 sessions, Focus Louisville is offered four times annually. The program spans 2 ½ days and offers a whirlwind “behind the scenes” tour of the community, exploring Louisville’s history, culture, business community, economy, arts scene, educational system, social services network and government. Participants experience hands-on learning and connections with the top leaders in every segment of our community. Focus Louisville graduates come away with knowledge of what Louisville has to offer, expanded networks across industries and sectors, increased exposure for their organizations, and are empowered to truly engage as a citizen. Over 200 leaders, from CEOs to community volunteers, participate in Focus Louisville every year, representing the region’s top companies and nearly every industry. The program cost is $600 with scholarships available based on need. To get more information or to register, call (502) 561-0458 or email Aimee Jewell at ajewell@leadershiplouisville.org. 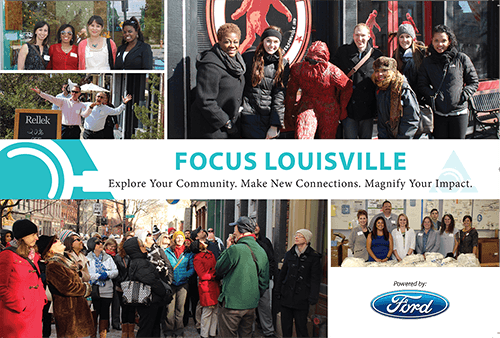 Ford Motor Company is presenting sponsor of Focus Louisville. DMLO CPAs, is a supporting sponsor.